Compare discounts for Hotels Motels Resorts in Ft. Myers, Florida! Located in southwestern Florida, the city of Ft. Myers sits in the center of what is one of the liveliest areas of the state; A year round playground with pristine beaches and full days of fun in the sun. Ft. Myers has two distinct parts: the city and Ft. Myers Beach. The city is located south of the Caloosahatchee River, and Ft. Myers Beach is located on Estero Island about 15 miles away. Both parts of Ft. Myers are worth a visit. The city has some interesting historical sites including the estates of Ford and Edison while the beach offers 'picture perfect' scenery with turquoise waters and white sand. Ft. Myers offers numerous hotels and resorts fit for every budget. Hotels at Ft. Myers Beach cater mainly to families on vacation while those in the city also cater to business travelers. Note: Lists are not identical. Different sites offer different accommodation options for Ft. Myers. The Quality Hotel Nautilus is located in Cape Coral minutes to beaches, shopping and attractions. On the south end of Estero Island is a stunning new Beachfront Resort inspired by the finest sugar white beaches in the world. Cool blues and warm taupe's are the colors of Gullwing. Soft sand and cozy quarters are the textures. First class amenities and casual elegance are what make Diamondhead Beach Resort the crowned jewel of Fort Myers Beach. Hospitality is the trademark of the twelve story resort and full service conference facility. Pointe Estero Beach Resort captures the true essence of a Florida vacation paradise. The Hilton Garden Inn Fort Myers is located in the Southwest business suburb of Fort Myers, 9 miles from Downtown Fort Myers, Sanibel and Captiva Island and Southwest Florida International Airport. Lover's Key Beach Club and Resort is a luxuriously appointed all suite resort situated in one of the most enchanting locations in Southwest Florida, on an almost private island centrally located between Fort Myers Beach, Bonita Springs and Naples. The Holiday Inn Select RSW Airport a full service hotel located 6 miles from the Southwest Florida International Airport (RSW), serving Fort Myers, Naples Cape Coral and Port Charlotte. Beautifully framed by the sugary white sands of the Gulf of Mexico and the calm waters of Matanzas Pass, the Pink Shell Beach Resort is nestled on 12 pristine acres on Florida's Fort Myers Beach. The Country Inn and Suites Fort Myers Sanibel Gate is located across the bridge from Sanibel Island, 15 miles from Southwest Florida International Airport, half a mile to golf course and public beaches and minutes from downtown and major businesses. The Best Western Waterfront is located on the shores of pristine Caloosahatchee River, 15 miles from Southwest International Airport and within proximity of the city center. The La Quinta Inn Fort Myers is located 12 miles from Ft. Myers Airport, three miles from the Bell Tower Mall and only half a mile from the Edison Mall. The Wellesley Inn and Suites Fort Myers is located on the perimeter of the newly developed business district, with easy access to all major highways and only 10 miles away from the Southwest Florida International Airport. The Homewood Suites by Hilton is located in the most fashionable and entertaining part of Fort Myers, six miles from the South West Florida International Airport and next to the Bell Tower Shops. Saks 5th Avenue and a 20-screen theatre frame the hotel. The Beaches of Sanibel and Captiva Islands are 12 miles from the hotel. 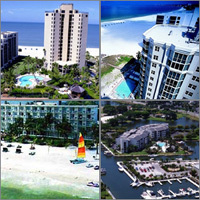 Nestled across from Fort Myers Beach on Estero Bay is Santa Maria Harbour Resort. By boat or by land, for a day or for weeks, the Harbour Resort is perfect for weekend getaways, fishing trips, group retreats, and family reunions. The Springs Resort is located only minutes away from many of southwest Florida's world-renowned attractions.